Todd’s Note: This FREE PDF of Aquaponics information for beginners has been provided by Al Hodges. Al spent a lot of time and effort putting together this document, as well as the slideshow (which will be posted in part 2 of this series). He is passionate about the topic of aquaponics, as you will note by this vast amount of information. Thanks Al! During several months, I researched aquaponics for my daughter and selected a great deal of information from sometimes contradictory sources. By comparing and logical selection, I prepared 35 pages of links to many selected sources of outstanding information. This free document with many, many links (one link provides over 900 YouTube videos) could be valuable for helping people start aquaponics projects. Obviously, most of these videos have not been viewed personally and common sense will determine if there is value in each presentation. For preppers, survival is important, but having products to barter in a ‘last case’ scenario is also important. A low cost system is fairly easy to learn and expand in modular form. A new grower may be considering a commercial operation, but do so only after several years of careful study and practical experience. There is no cost for this information, so there is no further support by me. From the links to hundreds of sources, you will find many willing to take your money for consulting. sweat, tears, and money. Most aquaponics gurus (except commercial firms selling kits) do not believe anyone should buy a commercial kit but should DIY with barrels, flat side-IBCs, wood and plastic tanks, and use gravity, pool pumps, and simple filters, worms, and pea gravel for their project. Aquaponics spamming is exceedingly annoying, yet a Google search for “Aquaponics” produces over 2.5 million hits – people are interested. 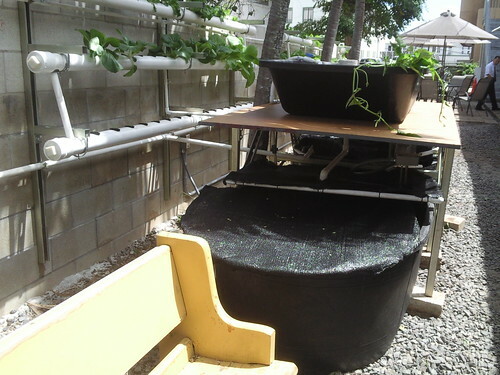 Many of us believe aquaponics is the agriculture system of the 21st Century. Growth has been slow since 900 A.D., or maybe 3,000 BC. This information will save a lot of time for beginners. This is a no-cost, open source document for anyone, but not for commercial use. The PowerPoint presentation is providing pictures instead of many thousands of words. My Wife & our family will be doing this along side our traditional (soil) garden, as well as chickens. This is a fantastic idea! EVERYONE should be doing this. Thanks, & GOD bless. Thanks ED. I am doing research on this very topic to occupy myself during retirement. Hello. I’m David from Slovenia and for my final work in college I’ll write about aquaponic. I’m wondering if you have any articles or on-line books about this topic? Thank you. David. The information in this pdf is pretty extensive.